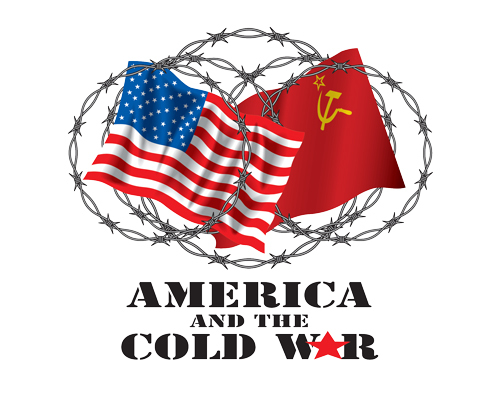 The Cold War began in 1945, as the United States and Soviet Union turned to face one another after defeating Hitler's Germany and Japan. While fighting the war, each side portrayed the other as an ally again fascism. America provided substantial assistance to the Soviet Union, whose people and military bore a great deal of the fighting and dying. Washington and Moscow negotiated key agreements at Yalta and Potsdam to structure the post-war world. But as soon as Hitler was gone, the Soviets began breaking their promises. They established puppet regimes in Eastern Europe, alarming and angering the US and "free" European countries. Suddenly the Soviet leader sometimes called "Uncle Joe" (Stalin) during the war came into focus again as a brutal dictator with an expansionist agenda. How did the Cold War begin? Some argue it was incubating for years after the Bolshevik Revolution -- and World War II was a "time out" in an inevitable clash between the communist Soviet Union and ﻿capitalist﻿ United States. From this perspective, the origins of the Cold War are simple: World War II left two major powers standing, both with visions of spreading their incompatible ideological systems. To paraphrase an old saying, when there are only two tough guys on the block, there's a good chance of a fight. Political and diplomatic disputes started even before the official end of the World War, including air and ground skirmishes. By 1950, US and Soviet pilots would be killing one another as part of the superpower proxy war in Korea, the first major armed conflict of the Cold War. Soviet government was not willing to give up its control of Eastern Europe. American leaders were not willing to give up the power and prestige the United States had gained throughout the world. The United States and Great Britain believed that the nations of Eastern Europe should freely determine their own governments. Stalin opposed their plans. The Soviet army had freed Eastern Europe from the Nazis, and it stayed in these countries after the war. 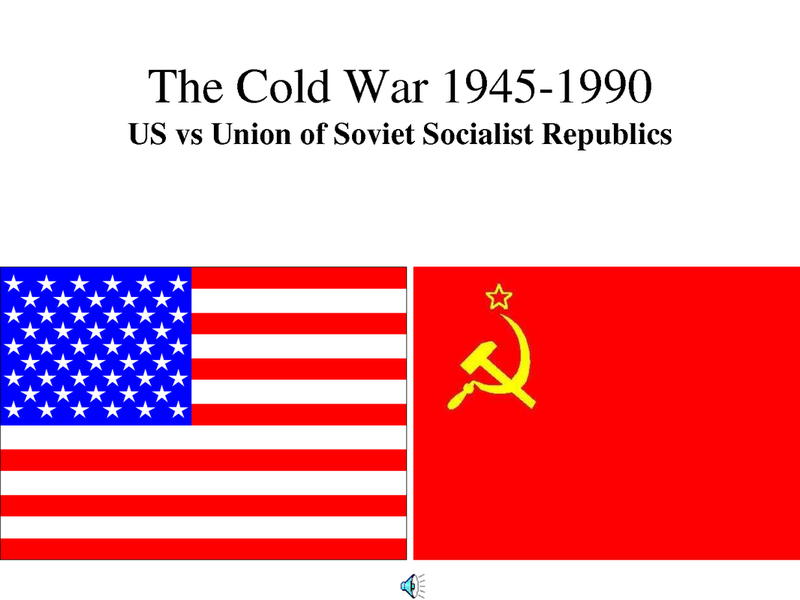 United States and the Soviet Union had become a fact of life. The United States adopted a policy of containment to keep communism within its existing boundaries and prevent further Soviet aggression. The European Recovery Program followed the Truman Doctrine in June 1947. It is better known as the Marshall Plan. The goal of the program was to rebuild the prosperity and stability of Europe. It included $13 billion in aid for Europe’s economic recovery. The Marshall Plan was based on the belief that Communist aggression was successful in countries that had economic problems. The Marshall Plan was not meant to shut out the Soviet Union or its Eastern European satellite states (states that are economically and politically dependent on a larger, more powerful state). But they refused to participate. The Soviets saw the Marshall Plan as an attempt to buy the support of countries. In 1949, the Soviet Union responded to the Marshall Plan by founding the Council for Mutual Economic Assistance (COMECON) to help the Eastern European states. COMECON largely failed, however, because the Soviet Union was unable to provide much financial aid. Germany was also an area of disagreement between the Soviets and the West. At the end of the war, the Allied Powers had divided Germany into four zones. Each zone was occupied by one of the Allies (the United States, the Soviet Union, Great Britain, and France). Berlin was also divided into four zones. 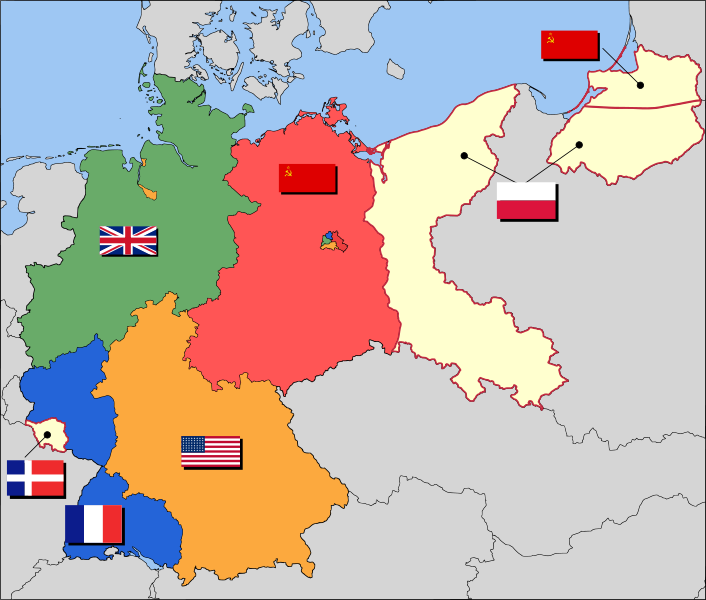 By 1948, Great Britain, France, and the United States were making plans to unify the three Western sections of Germany into a West German state. The Soviets were against this plan. They tried to prevent it by blockading the three Western zones of Berlin. Food and supplies could not get through to the 2.5 million people in these zones. To keep these people alive, the Western powers started the Berlin Air Lift. Supplies were flown in by American and British airplanes. More than 200,000 flights carried 2.3 million tons of supplies. The Soviets finally gave in and lifted the blockade in May 1949. In September 1949, the Federal Republic of Germany (or West Germany) was created. Its capital was Bonn. Less than a month later, a separate East German state, the German Democratic Republic, was set up by the Soviets. East Berlin was its capital. In 1949, Chinese Communists took control of the government of China. This added to U.S. fears about the spread of communism. The Soviet Union also exploded its first atomic bomb in 1949. The United States and the Soviet Union were soon involved in an arms race, in which both countries built up their armies and weapons. In the early 1950s, the Soviet Union and the United States developed the even more deadly hydrogen bomb. By the mid-1950s, both nations had intercontinental ballistic missiles that could send bombs anywhere. Both sides believed that they needed arsenals of nuclear weapons to prevent war. They believed that neither side would launch a nuclear attack, because the other side would be able to strike back with its nuclear weapons. In 1957, the Soviets sent Sputnik I, the first human-made space satellite, to orbit the earth. Americans began to fear that the Soviet Union had a huge lead in building missiles. The need for security during the Cold War led to the formation of new military alliances. The North Atlantic Treaty Organization (NATO) was formed in April 1949. Belgium, Luxembourg, France, the Netherlands, Great Britain, Italy, Denmark, Norway, Portugal, and Iceland signed a treaty with the United States and Canada. All of these nations agreed to help each other if any of them was attacked. A few years later, West Germany, Turkey, and Greece joined NATO. In 1955, the Soviet Union formed an alliance with Albania, Bulgaria, Czechoslovakia, East Germany, Hungary, Poland, and Romania. This alliance was known as the Warsaw Pact. To stop Soviet aggression in the East, the United States, Great Britain, France, Pakistan, Thailand, the Philippines, Australia, and New Zealand formed the Southeast Asia Treaty Organization. The Cold War intensified during the administration of U.S. President John F. Kennedy. In 1959, Fidel Castro overthrew the Cuban dictator Fulgencio Batista and set up a Communist government in Cuba. President Kennedy approved a secret plan for Cuban exiles to invade Cuba in the hope of causing a revolt against Castro. The invasion, called the Bay of Pigs, was a disaster. Many of the exiles were killed or captured. After the Bay of Pigs, the Soviet Union sent arms and military advisers to Cuba. In 1962, Khrushchev began to place nuclear missiles in Cuba. The missiles were meant to counteract U.S. nuclear weapons that had been placed in Turkey within range of the Soviet Union. The United States was not willing to allow nuclear weapons so close to the U.S. mainland. In October 1962, Kennedy found out that Soviet ships carrying missiles were heading to Cuba. He tried to stop them by blockading Cuba. This gave the two sides time to find a peaceful solution. Khrushchev agreed to stop the ships and removeSoviet missiles from Cuba if Kennedy pledged not to invade Cuba. Kennedy quickly agreed. The Cuban missile crisis had brought the world close to nuclear war. The realization that the world might have been destroyed had a profound influence on both sides. A hotline communications system between Moscow and Washington, D.C. was installed in 1963. The two superpowers could now communicate quickly in times of crisis. By 1963, the United States had been drawn into a new conflict—the Vietnam War. In 1964, under President Lyndon B. Johnson, more and more U.S. troops were sent to Vietnam. Their purpose was to keep the Communist government of North Vietnam from gaining control of South Vietnam. The United States saw the conflict in terms of a domino theory. According to this theory, if the Communists were able to gain control of South Vietnam, other countries in Asia would also fall (like dominoes) to communism. The United States failed to defeat the determined North Vietnamese. The large number of American troops sent to Vietnam soon produced an antiwar movement in the United States, especially among college students. Richard Nixon was elected president by pledging to stop the war. But ending the war was not easy. Finally, in 1973, President Nixon reached an agreement with the North Vietnamese that allowed the United States to withdraw its troops. Within two years, Communist armies from the North had reunited Vietnam. The domino theory turned out to be wrong. New nations in Southeast Asia were able to avoid Communist governments. A split between Communist China and the Soviet Union put an end to the idea that there was single form of communism directed by Moscow. Under President Nixon, American relations with China were reestablished. The Vietnam War showed that there were limits to American power. By the end of the war, a new era in American- Soviet relations had begun. World War II devastated the Soviet Union. To create a new industrial base after the war, Stalin emphasized the production of goods for export. In some respects, this led to a rapid economic recovery. By 1950, industrial production had surpassed prewar levels by 40 percent. New power plants, canals, and giant factories were built. Heavy industry (the manufacture of machines and equipment for factories and mines) increased, mainly for the benefit of the military. But the Soviet people did not benefit from the industrialization. The emphasis on heavy industry meant that not enough consumer goods were produced. The housing shortage was also severe. The average Russian family lived in a one-room apartment. Stalin was still the master of the Soviet Union. He did not share power and had little respect for other Communist Party leaders. His suspicions and lack of trust caused the repression in the Soviet Union to increase. In 1946, the government decreed that all literary and scientific work had to conform to the political needs of the state. Stalin died in 1953. A group of leaders succeeded him, but Nikita Khrushchev soon emerged as the chief Soviet policy maker. Khrushchev took steps to undo some of the worst features of Stalin’s regime. The process of eliminating the more ruthless policies of Stalin became known as de-Stalinization. Khrushchev loosened government controls on literary works. In 1962, for example, he allowed the publication of A Day in the Life of Ivan Denisovich by Alexander Solzhenitsyn. This book dealt with life in a Siberian forced-labor camp. Khrushchev also placed more emphasis on producing consumer goods. He also tried to increase farm production by growing corn and cultivating lands east of the Ural Mountains. The attempt to increase farm production failed. This failure and the increased military spending hurt the Soviet economy. Foreign policy failures also damaged Khrushchev’s reputation. After the Cuban missile crisis, he was voted out of office and forced into retirement. Between 1945 and 1947, Soviet-controlled Communist governments took control of East Germany, Bulgaria, Romania, Poland, and Hungary. In Czechoslovakia, there was a strong tradition of democracy and a multi-party system, so the Soviets did not seize control until 1948. Albania and Yugoslavia were also Communist countries, but the Soviet Union did not control them. During the war, both countries had strong Communist movements that resisted the Nazis. After the war, local Communist parties took control. In Albania, Communists set up a Stalinist-type regime that grew more and more independent of the Soviet Union. In Yugoslavia, Josip Broz, known as Tito, had been the leader of the Communist resistance movement. After the war, he worked to create an independent Communist state in Yugoslavia. Stalin hoped to gain control of Yugoslavia, but Tito refused to give in to Stalin’s demands. Tito ruled Yugoslavia until his death in 1980. Yugoslavia had a Communist government, but it was not a Soviet satellite state. Between 1948 and 1953, the Eastern European satellite states followed the example of the Soviet Union. They had five-year plans, with emphasis on heavy industry rather than consumer goods. They began to collectivize agriculture. They eliminated all noncommunist parties and set up secret police and military forces. But communism did not develop deep roots among the peoples of Eastern Europe. The Soviets exploited Eastern Europe economically and made living conditions hard for most people. In the 1950s and 1960s, the Soviet Union made it clear that it would not allow its satellite states to become independent of Soviet control. In 1956, protests erupted in Poland. In response, the Polish Communist Party adopted a series of reforms and elected Wladyslaw Gomulka as first secretary. Gomulka declared that Poland had the right to follow its own path. But Poland compromised. It pledged to remain loyal to the Warsaw Pact. In Hungary, economic problems and unrest led to calls for revolt. To end the rebellion, Imre Nagy, the Hungarian leader, declared that Hungary was a free nation on November 1, 1956. He also promised free elections. Three days after Nagy’s declaration, the Soviet Army attacked Budapest. The Soviets reestablished control over the country. Nagy was captured by the Soviet military and executed two years later. In Czechoslovakia, Antonin Novotny had been placed in power in 1953 by Stalin himself. In fact, he was called “Little Stalin.” By the late 1960s, Novotny had alienated many members of his own party. Czech writers especially disliked him. A writers’ rebellion led to Novotny’s resignation in 1968. In January 1968, Alexander Dub´ cek was elected first secretary of the Communist party. He began a number of reforms, including freedom of speech and press and the freedom to travel abroad. He relaxed censorship and promised to democratize the Czechoslovakian political system. A period of euphoria broke out that became known as the “Prague Spring.” In response, the Soviet Army invaded Czechoslovakia in August 1968 and crushed the reform movement. Gustav Husák replaced Dub´ cek, did away with his reforms, and reestablished the old order. In the 1970s, relations between the United States and the Soviet Union improved. This phase in U.S.-Soviet relations is called détente (the relaxation of tensions between nations). The United States began to sell grain and consumer goods to the Soviet Union. Détente collapsed in 1979, however, when the Soviet Union invaded Afghanistan. President Jimmy Carter stopped the shipment of grain to the Soviet Union. He also would not allow Americans to participate in the 1980 Olympic Games, which were held in Moscow. The Cold War intensified when Ronald Reagan was elected president in 1980. Reagan called the Soviet Union an “evil empire” and began a new arms race. Reagan also gave military aid to the Afghan rebels. When Mikhail Gorbachev became the leader of the Soviet Union in 1985, changes began that eventually ended the Cold War. Gorbachev made an agreement with the United States in 1987 to eliminate intermediate-range nuclear weapons. Both sides had reasons to slow down the arms race. Gorbachev hoped to make economic and other reforms in the Soviet Union. The national debt in the United States had tripled, and the United States had moved from being a creditor nation (a nation that exports more than it imports) to being the world’s biggest debtor nation. By 1990, both countries knew that their large military budgets would make it difficult to solve their domestic problems. Gorbachev stopped giving military support to Communist governments in Eastern Europe. This opened the door to the overthrow of Communist governments in these countries. A revolutionary movement swept through Eastern Europe in 1989. Germany was reunified on October 3, 1990. In 1991, the Soviet Union was dissolved. The Cold War had come to an end. Union to intervene if communism was threatened in another Communiststate. This was known as the Brezhnev Doctrine. Under Brezhnev, the government did allow more access to Western styles of music, dress, and art. But dissidents (those who spoke out against the regime) were still punished. Brezhnev continued to emphasize heavy industry. Problems weakened the Soviet economy. The government’s central planning led to a huge, complex bureaucracy. This discouraged efficiency and led to indifference. Collective farmers also had no incentive to work hard. By the 1970s, Communist party leaders and leaders of the army and secret police enjoyed a high standard of living and had become corrupt. By 1980, the Soviet Union was in serious trouble, with a declining economy, a rise in infant mortality rates and alcoholism, and poor working conditions. Within the Communist Party, a small group of reformers emerged. One of these was Mikhail Gorbachev. In March 1985, he was chosen to lead the Soviet Union. From the start, Gorbachev saw the need for radical reforms. The basis of these reforms was perestroika (restructuring). At first, this meant restructuring economic policy. Gorbachev wanted to start a market economy, in which consumers influence what is produced. But Gorbachev soon realized that it was not possible to reform the economy without political reform. In 1988, Gorbachev established a new Soviet parliament, the Congress of People’s Deputies. The members were elected and met in 1989. In 1990, Gorbachev allowed non-Communist political parties to organize. At the same time, he strengthened his own power by creating a new position—president of the Soviet Union. In March 1990, Gorbachev became the Soviet Union’s first (and last) president. As Gorbachev loosened the control of the Communist Party, ethnic tensions in the Soviet Union surfaced. Nationalist movements emerged throughout the republics of the Soviet Union. In 1989 and 1990, there were calls for independence in Soviet Georgia, Latvia, Estonia, Moldavia, Uzbekistan, Azerbaijan, and Lithuania. By 1991, many Soviet leaders were worried. The breakup of the Soviet Union would mean an end to their privileges. On August 19, 1991, a group of conservative leaders arrested Gorbachev and tried to seize power. The attempt failed. Boris Yeltsin, president of the Russian Republic, and thousands of Russians resisted the takeover. The Soviet republics now moved for complete independence. Ukraine voted for independence on December 1, 1991. A week later, the leaders of Russia, Ukraine, and Belarus announced that the Soviet Union had “ceased to exist.” Gorbachev resigned on December 25, 1991, and turned his responsibilities over to Boris Yeltsin, the new president of Russia. Boris Yeltsin was committed to introducing a free market economy as quickly as possible, but the transition was not easy. Economic hardships were made worse by a rise in organized crime. Yeltsin also used brutal force against the Chechens, who wanted to secede from Russia and create their own republic. At the end of 1999, Yeltsin resigned and was replaced by Vladimir Putin. Putin vowed to return the breakaway state of Chechnya to Russian authority. Fighting in Chechnya continued, and guerrilla attacks occurred in Moscow and in Chechnya during 2003. In July 2001, Putin began reforms to strengthen the Russian economy. The reforms included the free purchase and sale of land, tax cuts, and efforts to join the World Trade Organization. Since then, Russia had experienced a growing economy. This film demonstrates the history of the Cold War at home: During parts of the Cold War timeline, the threat of atomic war was a very real one in daily life. This film, using a friendly animated turtle, taught students to "Duck and Cover" upon seeing the flash of an atomic bomb. The film shows children jumping under desks, crouching down in the school bus and even throwing themselves to the floor when caught by the flash in a hallway. Sirens roar as kids seek out public shelters. This film demonstrates the impact of the Cold War abroad: One of the most dramatic locations in the Cold War was Berlin, the capital of Germany divided between the Soviet and American sides. This moving video shows people trying to escape the Berlin Wall, erected by the communists in November 1961 to keep their people in. The film shows a girl and woman separated from their families crying; people dangling out of a building along the wall and running to escape. The wall 15 feet high and 103 miles long remained up until November 9, 1989.